Fish is an important source of omega-3 fatty acids for brain and heart health, but it's also a good source of protein. Like other foods from animal sources, fish provides high-quality or complete proteins that contain all of the necessary amino acid building blocks to build and replace protein in the body. Haddock, a saltwater fish related to cod, is considered a lean fish. Salmon is a fatty-fish that is raised in saltwater and spawns in freshwater. Salmon has slightly more protein than haddock. Choosing one as a protein source depends on your preference for the content of other nutrients, such as fat and fatty acids, and the taste and texture. Every part of your body contains protein. The body continuously breaks down and replaces protein to build, repair and maintain its cells, tissues and organs. When you eat food that contains protein, the body extracts amino acids from the protein during the digestive process. The amino acids are used later to build and replenish the body's proteins. The 20 essential amino acids are those that the body can't make and that you must get from your diet. A dietary protein source is classified as a complete protein if it provides all of the 20 essential amino acids. Proteins from animal-based foods are complete proteins. The U.S. Centers for Disease Control and Prevention recommends that 10 to 35 percent of daily calories should come from protein. The recommended dietary allowance for protein for adults is 46 grams for women and 56 grams for men. A 6-ounce serving of haddock, cooked with dry heat, has 34 grams of protein, according to the U.S. Department of Agriculture. Unlike salmon, haddock isn't a fatty fish and has only 0.94 grams of fat in a 6-ounce serving. Haddock is considered a lean fish, which means that it has a fat content of 2 1/2 percent or less. Haddock is sold fresh or frozen whole or as steaks and fillets and works well with any cooking method. Haddock flesh is firm and mildly flavored. A 6-ounce serving of wild Atlantic salmon, cooked with dry heat, contains 43.25 grams of protein, according to the U.S. Department of Agriculture. Salmon is considered a fatty fish, with 13.82 grams of fat in a 6-ounce serving. Salmon varieties include Atlantic, king salmon, red, Chinook and sockeye. Pink salmon is usually sold canned. Salmon flesh ranges from soft to firm and pink to red, depending on the type. Both salmon and haddock are good sources of selenium, with 79.6 micrograms in the 6-ounce salmon serving and 53.9 micrograms in the haddock serving. The fatty acid content differs greatly. Fatty fish are especially high in fatty acids. The salmon serving has 2.137 grams of fatty acids and the haddock has 0.189 grams. 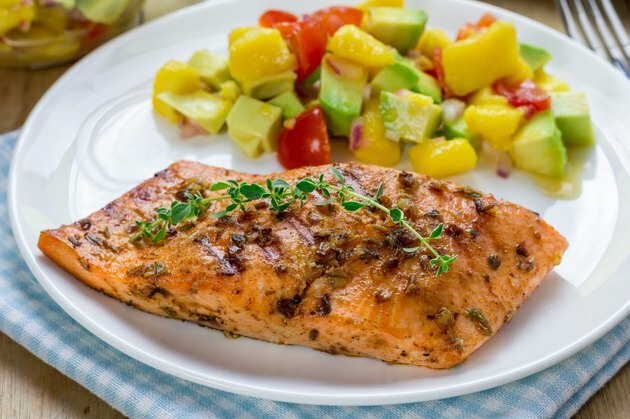 The 6-ounce salmon serving has 309 calories, 121 milligrams of cholesterol, 95 milligrams of sodium and is a good source of vitamin B-12 and niacin. The 6-ounce serving of haddock has 153 calories, 112 milligrams of cholesterol and 444 milligrams of sodium. Haddock is also high in magnesium. Haddock and salmon can be used in soups, casseroles, salads or as as a main dish. Salmon is often eaten raw with bagels and cream cheese, or as an appetizer. Pair haddock and salmon up with rice, potatoes or pasta.